Reiki is an ancient healing modality believed to have originated in Tibet thousands of years ago, and was rediscovered in the mid 1900's by Dr. Mikao Usui. 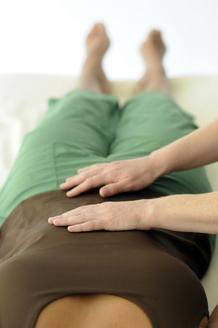 The word Reiki translates from the Japanese to "Spiritual energy" or "Universal Life Force". We therefore work with the energy of everything, believing that everything that is alive consists of spiritual energy, or Universal Life Force. This Universal Life Force energy is positive, infinite, and will never harm any living thing. Taking a step back to consider what the human body is made up of, is a great way to begin to understand the principals of Reiki. Physics shows us that when you break down the human body to the smallest cell, energy still remains. Energy cannot be created or destroyed; however, it can change, move and flow. We have all experienced this phenomenon. What makes us look up or turn around when someone across the room is staring at us? What gives us that feeling that raises the hairs on the back of our necks just before the car accident or fall? You know how some people just give you a "bad vibe" but you're not sure why? This happens when we pick up the shift of energy created between ourselves and the other person or situation. From this we realize that the energy can be moved and manipulated by everyone and everything. The movement and manipulation of energy forms the basis of Reiki healing. Reiki practitioners learn to move the energy that surrounds us all and increase its flow into the body of the recipient. As stated above, we are at our healthiest when there is a high level of energy flowing through our bodies and less chance of illness and/or stress. Our bodies heal themselves, this ancient healing modality simply helps to activate and accelerate the body's natural healing process, therefore providing a great complementary therapy for individuals with acute or chronic health problems. Best of all, one hour of Reiki is equivalent to 3 or 4 hours of deep sleep, that in itself is a wonderful and effective way to relax, relieve stress, and restore energy.